Free to members or with admission to the sculpture garden. Younger children should be accompanied by an adult. One project per person, please. Give the gift of the sculpture garden--or at least a tiny bit of it. 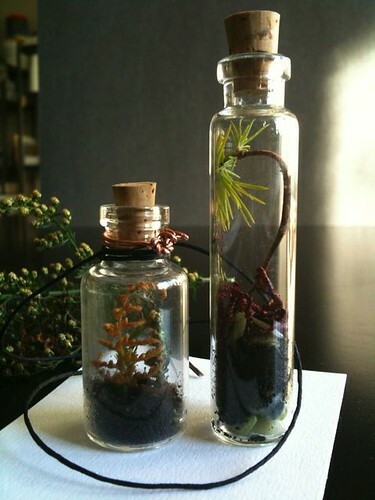 Holiday season is upon us and we will be making terrariums—miniature environments—that can be worn on a string, ribbon or chain. Choose among small glass bottles and vials and an assortment of natural materials to create your own unique, hand-made gift. Select dried materials that require no attention or construct a living pendant that will grow with your care. (Note that living pendants require water 3-5 times a week and at least 8 hours of indirect sunlight.) At 2 pm we’ll learn to fold an origami box to wrap the gift. Package your pendant with a Lynden membership for a gift that lasts all year long.